Hand-forged hardware with couture design completes the look and feel. Custom Wood Garage Doors offers the ultimate in style and color without compromising safety. With endless garage door color combination choices, you’re able to customize your garage door with a distinctive look and feel. 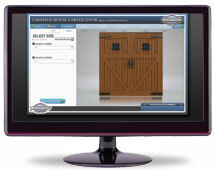 Use our Online Garage Door Design Center to build, customize, and purchase a new garage door to match your home.